Whoever said running was a solo sport needs to meet my team. It’s the truth. And marathon training takes an army. 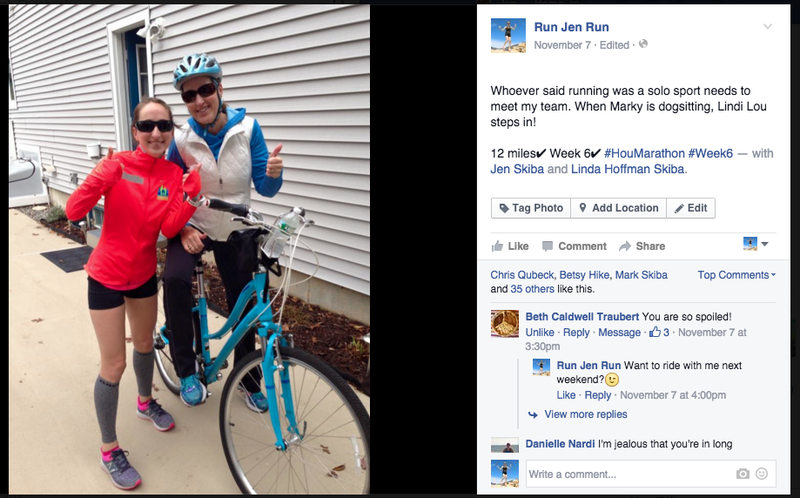 When I sign up for a marathon, I am making a huge commitment—a commitment that I take very seriously. I have friends that can run races with minimal training, without a training plan and can show up to a race and run great times. I’m not that person. Marathon training means 16-weeks focused on one scary 26.2 mile goal. That’s it. I know exactly what to expect and that terrifies me. If the race distance isn’t enough to scare you, think about the training and the journey it takes to get to the start line. I turn down a lot of plans. I go to bed early. My appetite is raging. Lots of running, lots of sleeping, and a whole lot of eating. 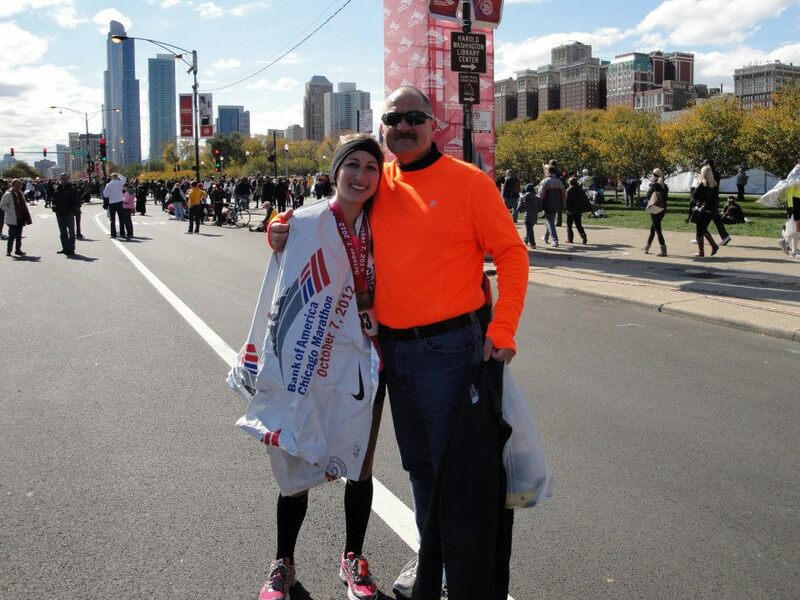 When I signed up for the Chicago Marathon in 2012, I didn’t ask my parents beforehand. I didn’t really think it would matter to them. Of course I invited them to join me for the trip but I didn’t expect them to come and I certainly didn’t expect them to be joining me every Saturday morning for my long runs and putting up with my crazy training antics. But they did. In fact a few weeks before the marathon, THIS HAPPENED and I was lucky enough to have my parents support and rode with me on every single run in the weeks leading up to the race—it didn’t matter how long or how short or even how crappy the weather was. This time around, I emailed my mom to see if she was up to a trip to Houston in January and ran a few things by her before actually signing up. 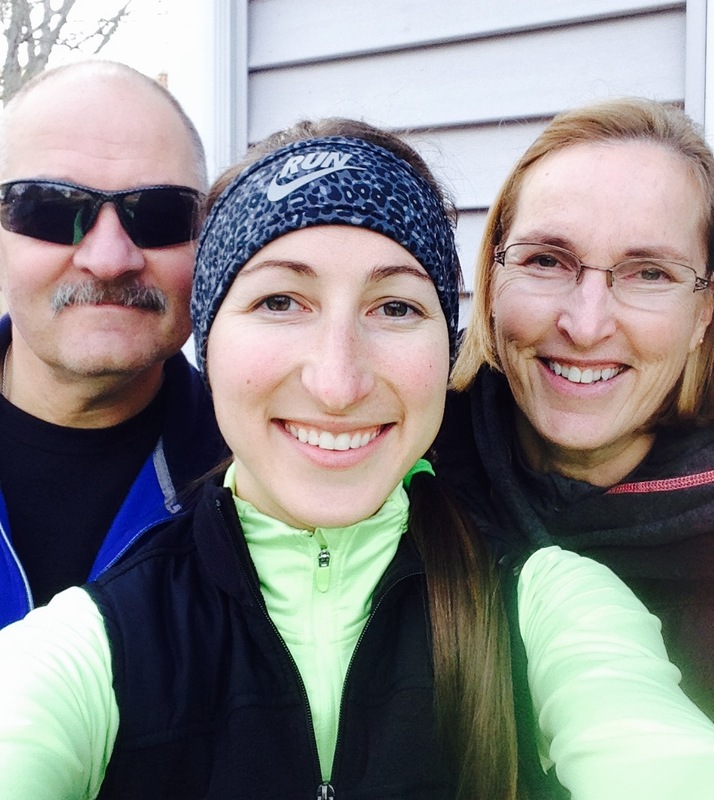 I no longer live at home so I knew training would be different but I have been still lucky to have either my mom or dad with me every weekend for my long run. Sometimes they trade off, sometimes mom bikes and dad stays home dog sitting my pup, sometimes they have the grill lit and ready to make lunch when I finish up and sometimes (like today) I get both of them to my ride and my mom even treated my dog to doggy day care so I could go home after my long run and spend some hours resting on the couch before my work Christmas party. My parents don't just help out on weekends, my mom has volunteered on numerous occasions to come over and walk my dog so I could stay after work and get in a run. The picture that will haunt him forever. My dad gets up early to run his own long run then hops on the bike to ride along with me. My mom and dad did not sign up for this. But they are sure are incredible and I am pretty lucky to have them. While I’m at it, my army also includes my coworkers and my clients. They are following along on my journey and constantly checking in with me to see how its going. Eric has been flexible with the schedule so I could fit in runs before it got dark out. My spinners think classes are actually HARDER now that I’m training while in fact I am working less which means I have to use more energy and motivation to make THEM work harder! :) My run club gang have also been great company on some of my shorter runs on days when I just don’t feel like running. My friends at Marathon Sports always have my favorite nutrition products and have been then when I needed new shoes, socks, and compression gear. Speaking of compression, I am grateful to be selected as a BibRave Pro for 2016 and SO EXCITED to get my first item to review—2XU Hyoptik Thermal Tights—which will be so wonderful for recovery during my final 5 weeks of training. I am laying on the couch as I type this wishing that they arrive in the mail today so I can wear them to my work Christmas party with my cute new shirt and nice boots! So to my army… THANK YOU! I appreciate each and every one of you and I couldn’t do this without you.